Enjoy brilliant sunsets from the covered porch. Banish tension in the bubbly hot tub. Unwind around the fire pit with s'mores & conversation. This mountain getaway is centrally located 10 minutes from white water rafting and the tourist train downtown. Breathe in serenity at Mountain Aire. 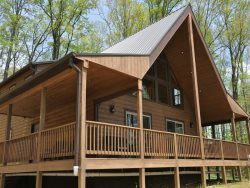 With three bedrooms and two baths, Mountain Aire Cabin is charmingly appointed and convenient to Bryson City and the area attractions. The Master Bedroom has a custom cedar log king bed, large walk-in closet, private bathroom and satellite TV with a sleeper sofa for bedding down those little ones. The second bedroom is downstairs with a custom cedar log queen bed and view of Alarka Mountain. The third loft bedroom has a western view and queen bed. Mountain Aire Cabin has the seclusion you want without being too remote. Well-equipped with gleaming stainless steel appliances, the spacious kitchen will bring out the gourmet cook in everyone! With mountain charm and an amazing view, The high-ceilinged great room with French doors opens to a wonderful view and features a gas log fireplace, flat screen TV and serves as a gathering place for watching videos or playing games. Wireless high speed internet access is available for those who need to check email, surf the internet or check in at the office. Relax on the porch with friends or a good book while enjoying the view, or soak up the glorious night sky from the hot tub. Make S’mores, roast hotdogs and tell ghost stories around the fire pit. Prepare some juicy steaks on the gas grill and dine alfresco at the picnic table. Enjoy your morning coffee from the breakfast table on the deck. Refresh yourself at Mountain Aire Cabin! We had lovely time! Can't wait to come back. Everything was amazing and beautiful! This has been the first time we have taken a vacation in the mountains with our Mom's. The cabin was perfect for our family. We can't wait to return. The staff was great, very informative and helpful. We actually didn't need to contact them at all, the entire weekend we were visiting. Excellent as always. Third time we have used Great Smokys Cabin Rentals. Everything has always been as advertised. Bryson City area is our favorite. We will be back. Sophia's First Smoky Mountain Experience! Visited Deep Creek, Cherokee, Gatlinburg, and of course downtown Bryson City. We had a wonderful week. Thank you for providing a beautiful place to wake up every morning! It was great. It was nice and peaceful without being too far out. It was nice and clan. We hope to come back during the summer or early fall with some friends. The team was phenomenal, so helpful. I cannot wait to come back. Excellent customer service!! Communication was great. We enjoyed our stay. The cabin was clean and well stocked with towels, linens, kitchen utensils/dishes etc. Outdoor area was beautiful as well. Gas Grill, charcoal grill and fire pit create a nice area to enjoy the outdoors. Hassle free booking and quality of customer support are excellent.! Had a great family vacation! We traveled through the mountains. Enjoyed the train to Dillsboro, shopping and spending time with family. Love grilling out, roasting marshmallows and relaxing in the hot tub watching the fire flies. Can't wait to return to this beautiful cabin. Our families got a chance to spend time together with the wonderful mountain views and yes the many trips to Ingles (love the rewards card you left us) and for those breakfasts to give us energy for tubing down the ice cold tumbling steams, walking and hiking in the Smokies. The early risers caresses their coffee cups and sat in the silence of the mountain mornings until the birds began to appear. Children's voices permeated the cabin with hopes of adventurous and fun. We took the train ride on our rainy day and enjoyed the game box, fire pit, and all the extras. Love the fire flies, and lady bugs and nature. The cabin was wonderful. The views are beautiful. We really enjoyed ourselves. The cabin was awesome!!! My Family had a wonderful time. The cabin had everything as pictured. Very clean and comfortable. Close to Nanthala and Bryson City. Secluded but not to far away from town. The road is very windy going up. Look forward to our next visit.